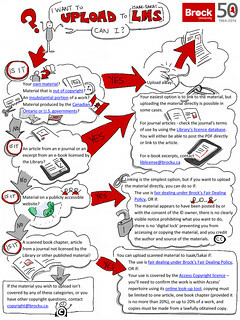 Doodled on original flowchart by Chabriol Colebatch, LLB, Copyright Coordinator / Legal Advisor, Brock University. [http://www.flickr.com/photos/jaymiek] The real work was done by our brilliant copyright coordinator, Chabriol Colebatch. Feel free to photoshop out the brock parts 🙂 Did you guys sign with access copyright? If not, be sure to photoshop that part too! @giulia.forsythe DUDE. That just gave me an idea. Thank you! !